New Item!!! Hypertech Max Energy 52501 - FREE Same Day Shipping!!! 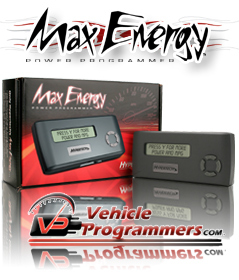 Why Buy From Vehicle Programmers? Vehicle Programmers is an Authorized Hypertech Dealer. Only Hypertech Products bought through an authorized dealer will include the support and warranty through Hypertech Products. Vehicle Programmers sells at MAP pricing. What does that mean to you? MAP pricing is the lowest price that we can sell your item without violating Hypertech pricing policies, and without voiding your warranty. If you ever find a product for less than our listed price, more than likely it is an unauthorized dealer or refurbished units. We highly recommend you think twice before altering something as important as your vehicles computer with their questionable product. Vehicle Programmers specializes in.... well... Programmers. Good luck getting help from one of those mega parts dealers if you buy from them. In most cases, they don't even know what end of the tuner to plug in. We get calls all the time from their customers who are now desperately seeking help. Our customers get the help they need from people who know the product. We ship LIGHTNING FAST! We don't wait around for days waiting to ship your new Hypertech Tuner. In fact, we don't wait around at all. At Vehicle Programmers, we guarantee to ship out within 24 hours of your purchase (excluding weekends and holidays), and in most cases we will ship within an hour of your purchase. And better yet, we ship from 4 different warehouses across the country, so we always ship from the one closest to you. This allows us to get the product to you even faster. Once you click the "Add to Cart" button, you better start watching the mail box, because your new tuner is on it's way!